Fall is my favorite time of year, so I wanted to show you some of the fall-ish things going on in our home. Thanks to Pinterest, I have been really into bunting. Due to my one-handedness, I had to have my mom trace and cut them out for me. They aren't all that advanced as far as buntings go, but they still make me really happy! This one says "Trick or Treat." Beck's "Crafting for Dummies Tip:" For easy bunting, pick out a fun combo of scrapbook paper, cut into triangles, print out letters on computer paper or use stencils. Fold over a string or ribbon and hang as desired. So easy! This one says "Happy Fall." 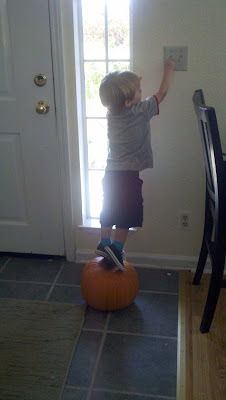 LJ found a more practical use for the fall decorations. Do you have a great fall or pumpkin recipe? Maybe a fun fall craft idea for home decor or kids? I am always looking for ways to become more "Martha." Add your ideas or links in the comments and help a non-domestic diva out! Love the bunting friend! I'm so impressed with the skill and only one hand! Let's see Martha do that!